After the terrible 48 hours of rain over the Midsummer weekend, you just had to know that the Monday wasn’t going to be so bad – and so it proved. 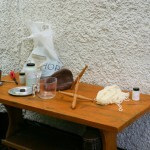 It was however a bit of a relief as the spinning group were hoping for an afternoon spent dyeing wool the natural way. 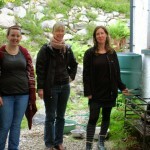 Just a month after we moved here in 2002, I took the opportunity to go to the Isle of Harris to do a course, run by Margaret MacKay, on the traditional methods of dyeing wool to make the famous Harris tweed. She had been doing this for 30 years and really knew her stuff! I went for five days, made some new friends and really learned how to dye. A year or so later, a course was laid on in the village here, just two days of dyeing, and I went along because I was sure there would be something more to learn, but truthfully there wasn’t. Margaret’s course had been so comprehensive, there was nothing more to learn about the actual techniques, although of course there is always room to experiment with different dyestuffs and colours! You may wonder why this was a weather specific activity. Margaret’s course had taken place entirely out-of-doors, and she told us that that was partly because the tradition up here was always for dyeing out of doors, and you frequently see pictures of natural dyeing going on in big pots over peat fires. Another good reason is that although the smells coming from the pot can be really pleasant outside, it can be somewhat over-powering in the confines of a kitchen! I had cheated a bit however – because the weather had been so foul, I did mordant the wool beforehand on the gas hob indoors on the Saturday. Good mordanting is the key to the dyeing process. Pre-mordanting with alum fixes the colour into the yarn, and also affects to a certain extent the colour achieved. Certain wood barks don’t need a mordant to fix the colour, probably because they are high in tannins, but everything else really does. People worry about this, they think that they are using harsh “chemicals”, but in fact alum is a naturally occurring mineral, which I believe is a by-product of coal mining, and has been used in dyeing since Adam walked the earth – or at least since the 15th century to my certain knowledge, but maybe longer. The other mordants used are also mineral in origin, copper, iron, tin and chrome. Tin brightens colours but can make the wool harsh, so I tend not to use it. Chrome is pretty nasty stuff, so although it often produces beautiful shades, again I tend not to use it. To mordant the yarn, you make a paste of 3oz alum and 1 oz cream of tartar and a wee bit of water, which you then add to a big pan of cold water. You insert the yarn, which has already been soaked, and bring the whole lot to just under boiling point, taking at least an hour to do this. You then let it simmer for half an hour. I was a bit worried on Saturday because I found that doing this on the hob, which has a higher pressure than my camping gas stove, plus a bit of lack of attention on my part, had meant that the pot boiled! However, all seemed well when we came to dye with it. Once the job is done, the water can be thrown down the sink because that is all it is – water. The alum has now precipitated into the wool. Andrea arrived at about mid-day and we went out gathering. 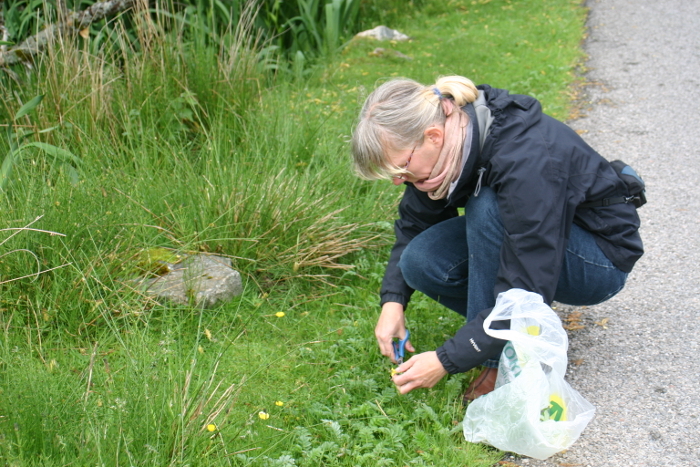 I had noted that there was a plentiful supply of horsetails and silverweed just down the road from us and that is where we headed. These are two of the wild flowers which were regularly used in the creation of colours for the tweed up here, but as they are living plants, it is a bit time specific as to when you can use them. Margaret always held two courses in the year – one in the middle of June, which is when I went, and one two weeks later. There are later and earlier dyestuffs to be had, but this Monday was really going to be our last opportunity to get colour from these particular plants. As it was, the colours were paler than those in my sample book from the course, which I think was probably to do with those two extra weeks of growth – in spite of the fact that things are late this year. 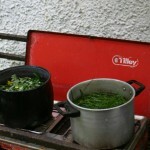 When we got back, Andrea and I put the first lots of stuff on to cook, using rainwater as it is ph neutral. We also put the mordanted yarn on to soak. At that point, Jorine and Jennifer arrived, and we sat down to a lunch of soup while popping out occasionally to check the pots. As we didn’t have a lot of time on the day, I decided to cheat a bit and do a pot of onion skins indoors while the other stuffs were cooking, as they would take about half an hour to get as much colour out of the stuff as we could get. For onion skins, you pop the soaked wool straight in with the skins and then take them out at different times to get different colours. They give a wonderful range of yellows and oranges through to quite a deep brown if you leave them for about half an hour. Having done the same thing with the horsetails, we took the first lot of yarn from the silverweed pot. This was a lovely shade of “Isabella Yellow” but that wasn’t the end of it. I then added a teaspoon of iron to the pot, and re-inserted some of the yarn which then came out a very pretty bluey green. We did the same process to the horsetails, which started as a shade of green. For the second boiling, I popped in some sweet cecily from my dye garden, and that gave a more olivey green, and then the addition of a copper mordant gave a stronger green. There was enough time now to think about making a dye pot with logwood. This was traditionally used up here, imported of course along with madder root for red and the alum for mordanting. So I emptied the pots and put logwood in one and just for fun, a few annato seeds in the other – annato being a wonderful source of colour which is also used to make cheese red. In this part of the world, the logwood was used only for over-dyeing and was used very sparingly as it was expensive, but we did both logwood alone and also over-dyed some of the other colours with interesting results! The purple we got from the logwood used alone was stunning. I had been a bit mean with the annato seeds, but the colour it gave was a gorgeous peachy orange – so I would say that being mean with it was not a bad thing! PS: If you want to do some natural dyeing yourself, P&M Woolcraft have a mail order service via the internet which supplies pretty much everything you would need. 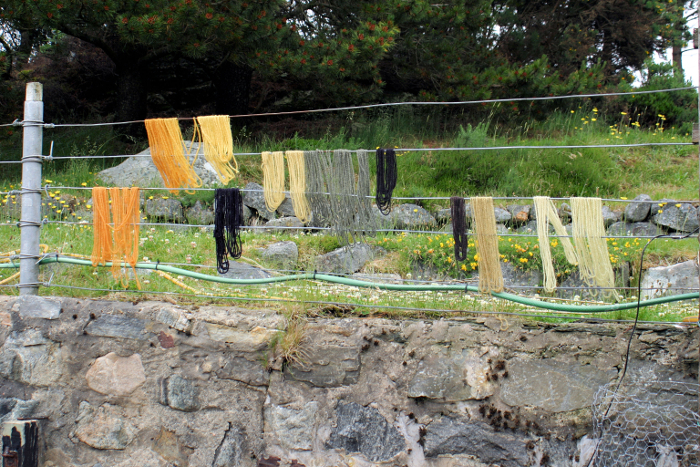 This entry was posted in Local area and tagged natural dyeing, wild flowers. Bookmark the permalink. Beautiful colours. Another dye source not needing a mordant are all the lichens. Loved reading this! I would so enjoy doing that! Thank you for that. We are planning another dyeing day in August when we will be using the later flowering plants such as tansy. The colours we got from onion skins were also so popular with the group, that we will do some more – those at least can be used at any time of year. 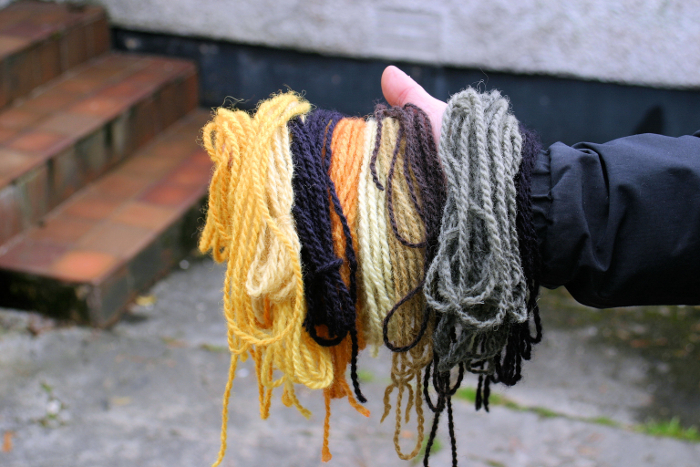 Natural dyeing is great fun – I call it a cross between cooking and magic. In the archive on this site, there is also a post on the subject from when we did a bit for the Old Folk in the Assynt Centre – you might like to look at that. I think I might also post the method for mordanting the wool as soon as I can. Otherwise, watch out for the next post on this subject – and maybe have a go yourself!